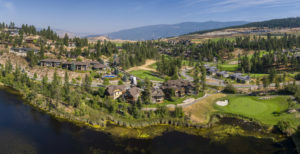 As if the Okanagan Champagne Powder, the snow ghosts and the completely ski-in-ski-out Village weren’t enough to make Big White Ski Resort stand out, we are also the first ski resort in North America to have our very own chocolates – dreamt up, designed and distributed by Executive Chef Rob Walker. In 2017, Chef Walker visited the prestigious Cacao Barry Or Noir laboratory in France with the goal of bringing back a signature chocolate the resort could call its own. 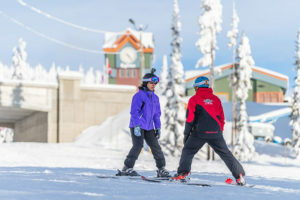 Big White has been playing with the chocolate in its menus since receiving it in May 2018, and over the winter season, you can expect to see more chocolate-y goodness pop up all over the resort. Chef Walker developed the recipes from seven organoleptic notes (aromatic, fruity, etc.) and 20 secondary notes (spicy, floral, liquorice, etc.). His milk chocolate, he says, is not too sweet, with notes of caramelized honey. The beans for the milk chocolate came from Ghana, the Ivory Coast and Ecuador. The dark, with beans from Santo Domingo and Mexico, has fruity undertones and isn’t too bitter because it’s still under 70 per cent cocoa. 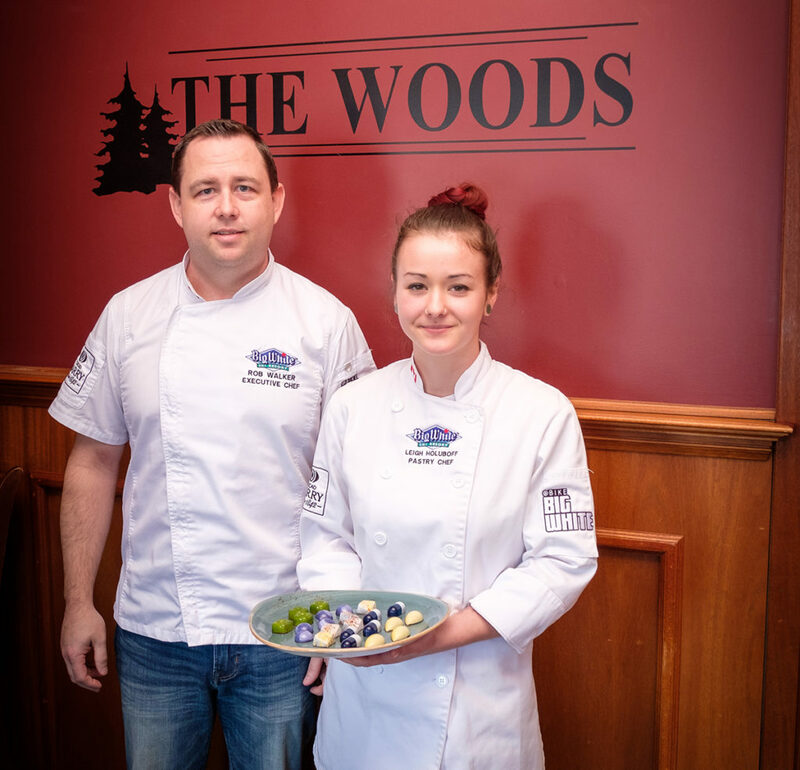 Leigh Holuboff, Big White’s pastry chef, has spent the past few months putting her own culinary touch on the chocolates – transforming them into menu items around the resort, including cookies, muffins and desserts at Big White restaurants. The award-winning graduate of the Okanagan College Culinary Arts program is in her second season with the resort, but has been baking with her grandma since she was a child – and since graduating, has taken classes and workshops specific to the art of chocolate. Find Big White milk and dark chocolate in the pastries at our coffee shop in the Village Centre Mall. Dip one of our Monashee Milk cookies into a Tug No. 6 cappuccino. Bring an appetite, because the cookies are giant and have perfectly melted chocolate chunks, so you’re not going to want to save any for later. Trust us, you’re going to want to save room for dessert. The O’r Noir Cream Puff at The Woods is the chocolate equivalent of heaven. Just read the ingredient list: Alpine Noir cremeux, Monashee Milk chocolate cream, caramel, toasted marshmallow, caramel milk crumb. Drool. Since everyone should enjoy Big White chocolate, regardless of dietary restrictions, Holuboff devised a decadent gluten-free, vegan brownie that you can hardly tell is gluten-free and vegan, available at Black Forest Day Lodge and Clocktower Coffee. Walker and his team of chefs, including Holuboff, use the chocolate in savoury dishes for VIP dinners and special events. 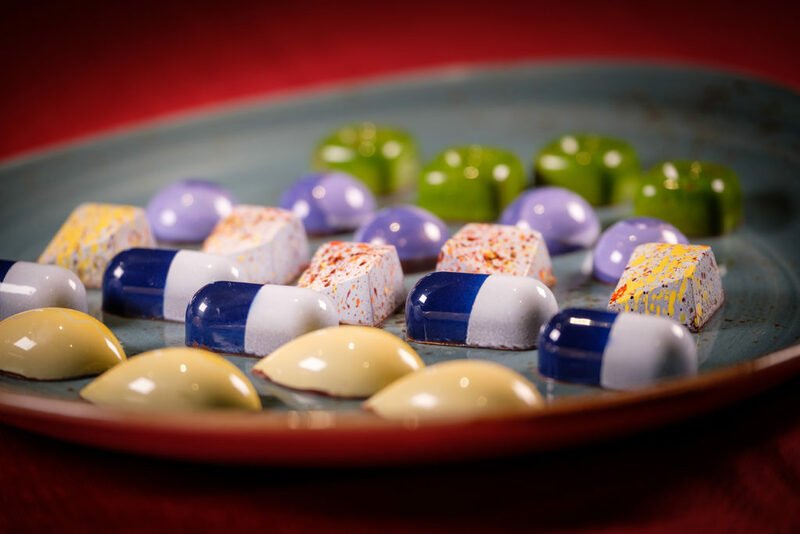 Holuboff also transforms the chocolate into colourful bonbons – with flavours like passionfruit and earl grey. On March 6, Holuboff is hosting a Chocolate Masterclass as part of our inaugural Gourmet Ski Week. Guests will learn how to work with chocolate and use it in recipes – plus taste it in chocolate cocktails, snacks and treats. Tickets are $25 for the class, and $699 to attend the 3-day, 4-night culinary escape.